Growing Peppers Can Be Addictive! If you're a spicy food fanatic, growing peppers can become addictive because there are so many hot pepper varieties you'll want to try. If you love sweet peppers, you may be surprised to learn there are almost 100 different varieties readily available to the backyard vegetable gardener. Peppers are easy to grow in both container and traditional vegetable gardens. They grow 2-3 feet tall and require full sun exposure. Depending on the variety of pepper plant, fruit will be produced 65-130 days after transplanting in the garden. When most people think of sweet peppers, bell peppers usually come to mind. There are several varieties of bell peppers available. However, there are many other varieties of sweet peppers including Italian sweet peppers, Mediterranean sweet peppers, and sweet banana peppers, just to name a few. The Jalapeno is probably the most well known hot pepper variety. 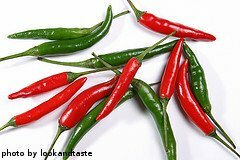 Hot peppers come in a wide range of heat levels, from mild to flaming hot. The chemical that gives hot peppers their heat is capsaicin (cap-SAY-sin). The amount of capsaicin in a pepper determines how hot the pepper tastes. The more capsaicin, the hotter the pepper. Incidentally, capsaicin is the key ingredient in pepper spray. Heat levels in hot peppers are measured using the Scoville scale. An average Jalapeno pepper registers approximately 5,000 units on the Scoville scale. A Cayenne pepper registers 40,000 Scoville units. A Habanero pepper registers 220,000 Scoville units. Using this scale, it can be determined that Habanero peppers are about 44 times hotter than Jalapeno peppers. A quick side note - law enforcement grade pepper spray registers about 2,500,000 Scoville units. 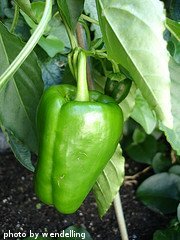 Interested in growing peppers that have just a little heat? 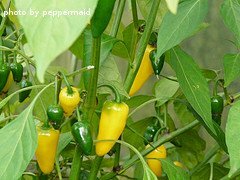 Try growing Anaheim or Pablano pepper plants. 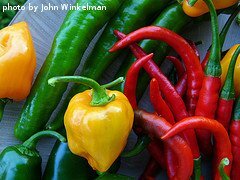 For a little more heat, try growing Jalapeno or Serrano pepper varieties. Some hot pepper varieties that pack a good heat punch are Cayenne, Thai and Tabasco peppers. If you're interested in peppers with maximum heat, try Habanero or Scotch Bonnet varieties. Peppers can be expensive to buy in the grocery store. Some bell peppers can cost $1 or more each. A bell pepper seedling might cost the same amount, and it will produce 6-10 peppers or more. If you like to eat peppers, growing your own can save a bunch of money in the long run. For other ways to save money, check out Frugal Living Tips. They have great ideas about how to lead a less wasteful lifestyle without debt, and still to be able to enjoy all the good things that life has to offer. Growing peppers in your backyard vegetable garden requires minimal effort. Plant them, support them and watch them grow. As long as you keep picking the peppers, the plants will continue to produce fruit for several weeks. The following links will tell you what you need to know when growing peppers, both hot and sweet.